In fact, two in 10 teachers said their students get no CS education at all. In their schools, 60 percent said CS wasn't part of the curriculum; 30 percent said a lack of funding held their schools back; and 25 percent said that it wasn't covered because it's not a subject that students were tested on. These results came from a November 2018 online survey of 540 K-12 teachers Microsoft commissioned by YouGov, a public opinion company. Microsoft released the findings as part of "Computer Science Education Week," which takes place this week in schools all over the world. Along with the survey results, the company also shared links to its own teacher resources. Many teachers expressed feelings of inadequacy in teaching CS. Thirty percent said they felt "under qualified" to help their students prepare for a more digital future; 20 percent said they felt "overwhelmed" by the prospect of teaching CS. Yet most (88 percent) also recognized that a grounding in CS was important for helping students prepare for their futures. And that's not just as programmers or computer engineers. More than eight in 10 (83 percent) consider coding to be an important aspect of helping build students' creativity. 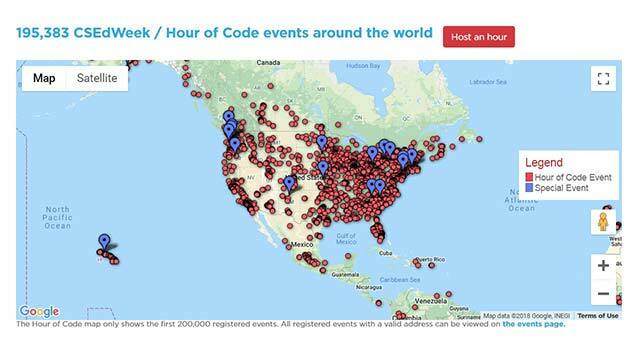 Microsoft has committed a hefty $10 million through 2020 to help Code.org, an organization that promotes Hour of Code, a program of tutorials that give students exposure to programming concepts as part of CS Education Week. The funding will help the nonprofit lobby for all U.S. states to pass policies supporting access to CS and expand access in every school to Code.org's teacher training programs. Access to Microsoft's newest Minecraft tutorial, which helps students understand two programming concepts, loops and conditional statements.